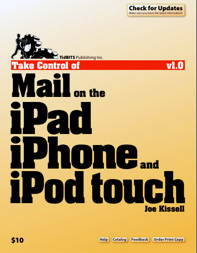 In the latest series of Take Control books, Joe Kissell tackles the subject of using Mail.app on an iPad, iPhone or iPod touch. Having used Mail.app for around two years now, both on my laptop, iPod touch, and iPhone, I thought I knew everything I needed to know for my purposes. You know the old adage, “you learn something new everyday” that your parents and teachers kept repeating to you day after day? They were right-I picked up a few tricks after reading this ebook. The beauty of the Take Control series of books is that it focuses on one subject. There’s no need to buy a Mac OS bible if you just want to learn more about one aspect. The beauty of Joe Kissell as an author of many Take Control books is that he writes for a wide audience, yet he is able to get his point across without being boring or condescending. Readers new to Mail.app can easily follow along, while the more experienced among us will find the information presented interesting and conversational. Like many other how-to books, Take Control of Mail on the iPad, iPhone, and iPod touch can be read sequentially or referred to on an “as needed” basis. Information that is discussed in more depth elsewhere in the book is linked for easy navigating, as are links to web sites and applications that give the reader additional information or clarification. Visual learners will benefit from the screenshots scattered throughout the book. One problem with any type of computer reference book is that the information is only accurate up until the time of publication. The world of technology evolves so quickly that by the time the book is published, the subject matter may have changed-new versions of an application could be released, or a computer configurations may be slightly different. TidBITS Publishing has addressed this issue by placing a button on the cover of the ebook that allows readers to check for updates of their book, which can be downloaded at no additional cost. But it doesn’t stop there-readers can download various versions of the ebook to read on an ebook reader, such as the Amazon Kindle or Sony Reader, and keep up with changes on the ebook’s blog. What did I learn from this ebook? For starters, I now know what the “All Mail” mailbox is in GMail. And the concepts of “POP” and “IMAP” are a little more clear. Take Control of Mail on the iPad, iPhone, and iPod touch is 96 pages packed with information on how to make the most out of using Mail.app. The $10 investment is a small price to pay for what you’ll get in return.